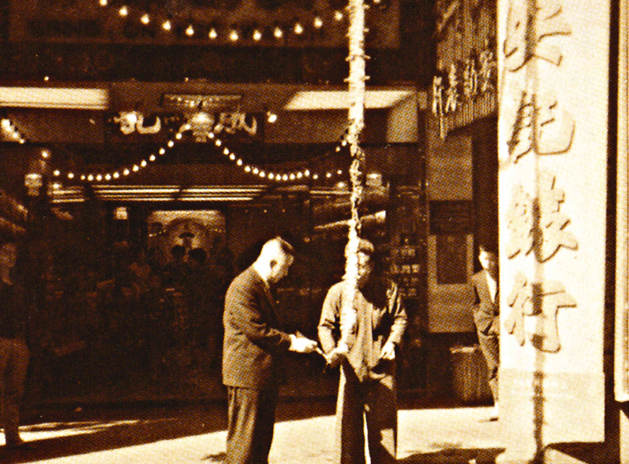 In 1942, Mr. Yeung Shing, founder of the Emperor Group officiated at the opening of Shing On Kee Watch Shop in Shanghai Street amid booming firecrackers, unveiling a historical prelude for the Emperor Group. 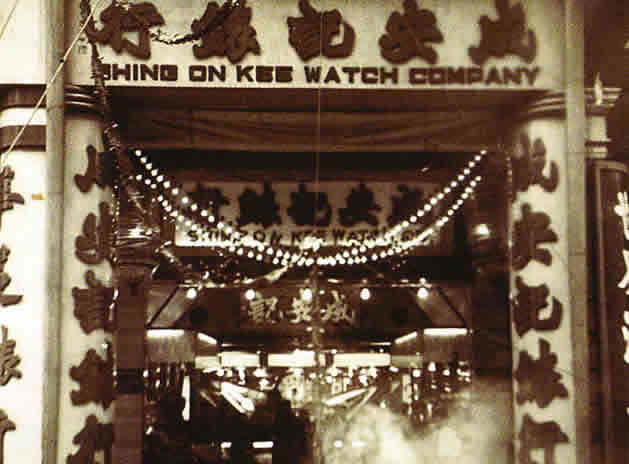 Shing On Kee Watch Shop expanded its retail operation on Shanghai Street in 1949. Observatory Watch & Jewellery began business at 499 Nathan Road, Kowloon in 1964. 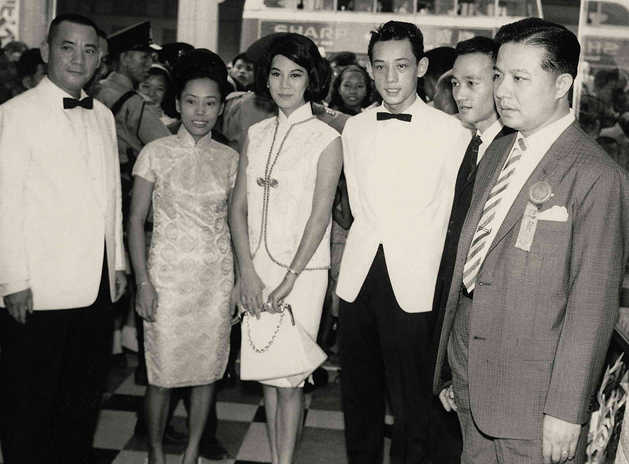 Asian movie queen Ms. Ivy Ling Po (third left) and Dr. Albert Yeung (third right) officiated at the shop’s opening ceremony. 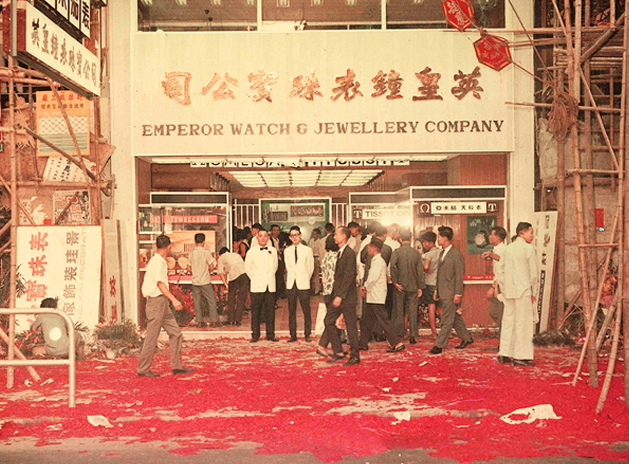 Grand opening of Emperor Watch and Jewellery Company located at the ground floor of Jade Mansion at the juncture of Nathan Road and Waterloo Road in November 1965. 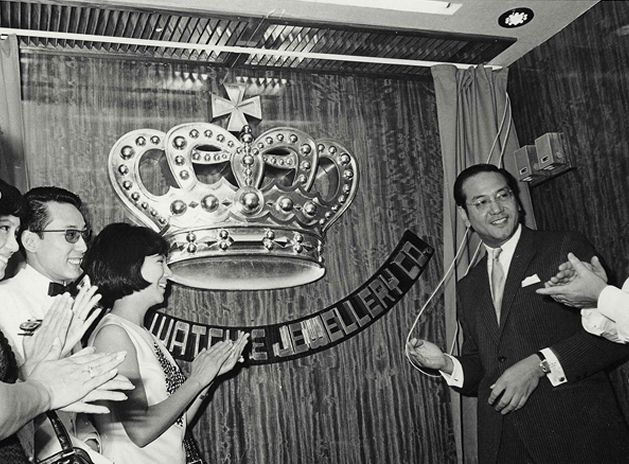 Grand opening of Tsim Sha Tsui branch of Emperor Watch and Jewellery Co. Ltd at 81 Nathan Road in 1968, with Mr. Samson Sun J.P.M.B.E. (first right) performing the officiating ceremony. Observatory Watch & Jewellery was appointed authorized retailer of Rolex and Omega in 1972. 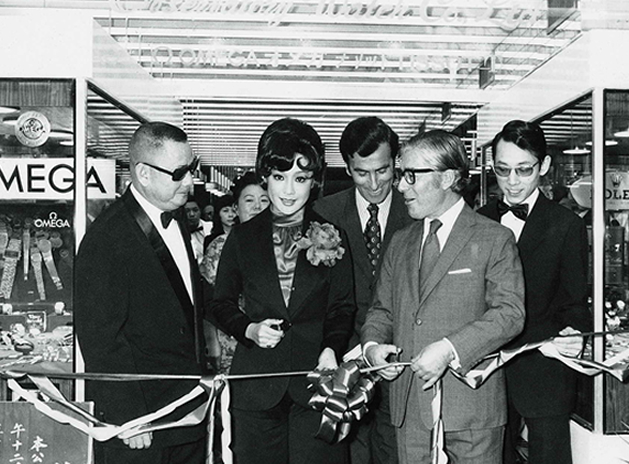 Dr. Albert Yeung (first right) along with the Swiss Ambassador to Hong Kong Mr. H. Suter (third right), General Manager, Rolex Hong Kong Co. Ltd., Mr. Hans Brunner (second right) and Asian movie queen Ms. Betty Li (second left), performed the ribbon-cutting ceremony to celebrate the shop’s expansion. 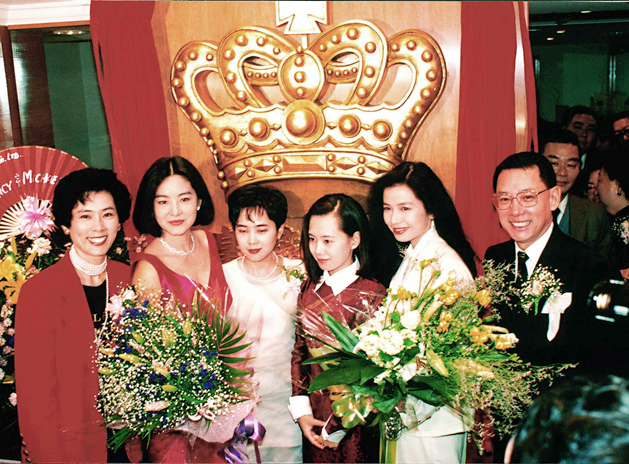 Ms Cherie Chung (second right) and Ms Brigitte Lin (second left) showed up in style to celebrate the business expansion of Emperor Jewellery Tsim Sha Tsui branch at a grand ceremony in 1990. 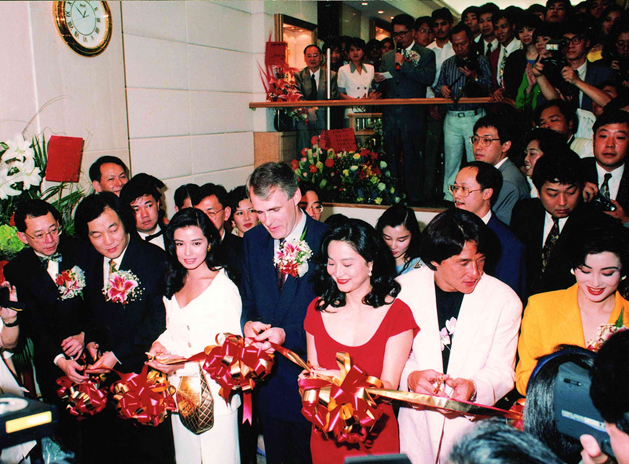 (From third left) Ms Cherie Chung, Mr David Eldon, the General Manager of HSBC, Ms Brigitte Lin, Dr. Jackie Chan and Ms Cheung Man, officiated at the ribbon-cutting ceremony together at the grand opening of the Emperor Watch and Jewellery branch in Central in 1992. 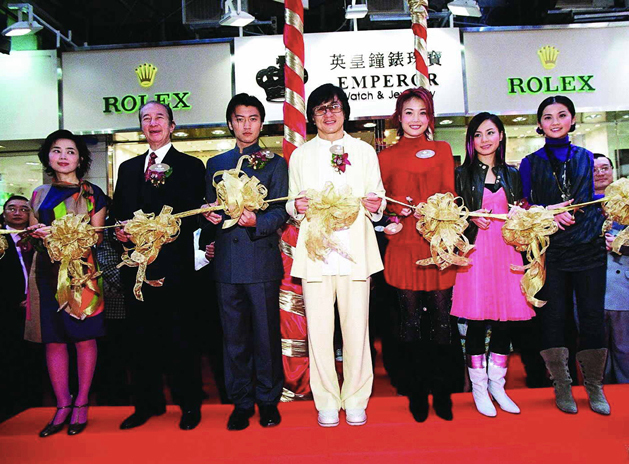 In 2004, Emperor Watch and Jewellery opened its new shop in Russell -Street, Causeway Bay. (From the left) Ms Cindy Yeung, Dr Stanley Ho, Nicholas Tse, Dr. Jackie Chan, Joey Yung and Twins officiated at the ribbon-cutting ceremony. (From the left) Ms Cindy Yeung, Mr Hans Jakob Roth, Consul-General of Switzerland, Ms Sharapova, champion of the US Tennis Open Finals, Mr. Zhou Junming, Deputy Director of the Beijing Liaison Office of the Central People’s Government stationed in the Hong Kong Special Administrative Region, famous pop star Ms. Joey Yung and Mr. Andrey N. Smorodin, Consul-General of Russia officiating the ribbon-cutting ceremony of flagship store in Oterprise Square at Tsim Sha Tsui on January 07, 2007. 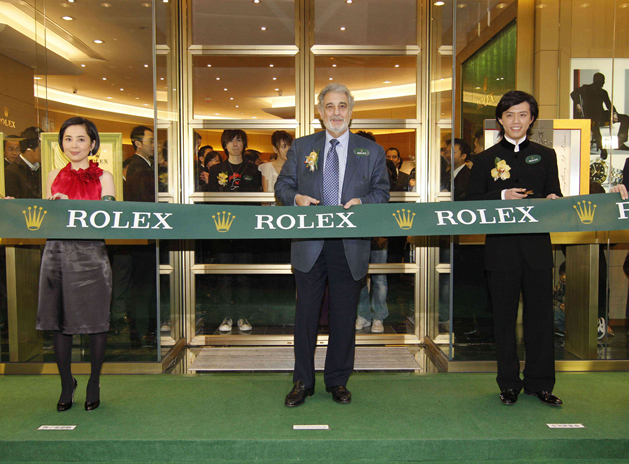 (From the left) Ms Cindy Yeung, Managing Director of Emperor Watch and Jewellery, Mr. Plácido Domingo, The World’s Greatest Tenor and Mr. Yundi Li, International Virtuosco Classical Pianist, officiating the ribbon-cutting ceremony of Emperor Watch and Jewellery Rolex Boutique at No.8 Russell Street, Causeway Bay on February 28, 2008. 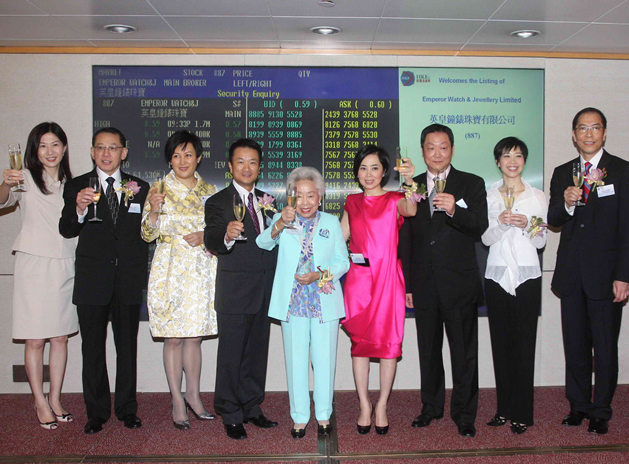 In July 2008, Emperor Watch & Jewellery Limited has commenced dealing on the Main Board of the Stock Exchange of Hong Kong Limited (Stock Code 887). 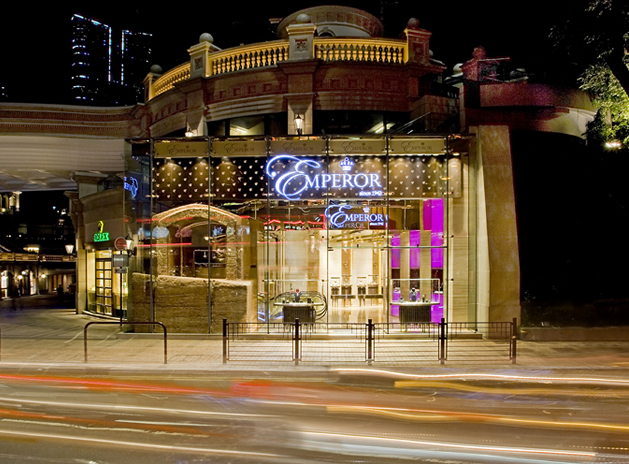 In 2009, with the grand opening of the first Emperor Jewellery flagship store at Tsim Sha Tsui "1881 Heritage", the brand strengthens its jewellery business and image in market. 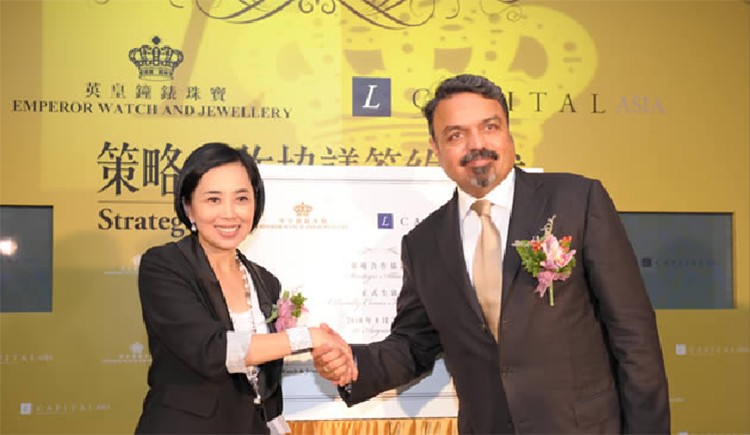 In August 2010, Emperor Watch & Jewellery enters a strategic alliance with L Capital, subsidiary of LVMH Group. By teaming up with global fashion icon, Emperor Watch & Jewellery strengthen its leadership in the Asian luxury consumption market. Famous pop stars Ms. Joey Yung and Mr. Leo Ku attends Grand Opening of Emperor Jewellery’s New 1881 Heritage Image Store with Mrs. Rita Hämmerli-Weschke, Consul General of Switzerland, Mr.Chiu Kwok Hung, Executive Director of Cheung Kong (Holding) Limited and Ms. Cindy Yeung, Chairperson & Managing Director of Emperor Watch and Jewellery Limited in celebration for the opening of Patek Philippe, Chopard and Emperor Jewellery New Image Store. 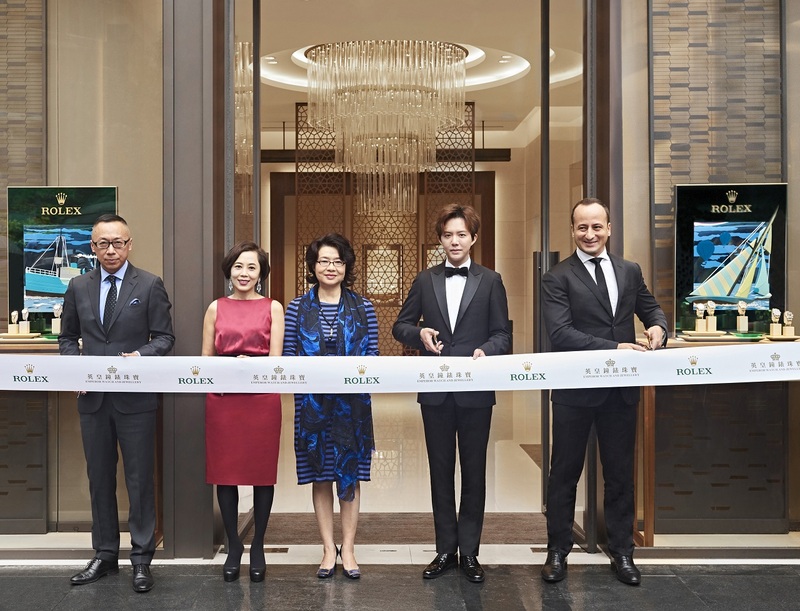 Emperor Watch and Jewellery’s Rolex Boutique at Chongqing Times Square had a grand opening on September 7, 2018 with (From the left) Mr. Paul Li, General Manager (Operations) of Long Qing Property Development (Chongqing) Co. Ltd.; Ms Cindy Yeung, Chairperson and Chief Executive Officer of Emperor Watch and Jewellery; Ms. Dai Ling, Vice Chairman of Chongqing Yuzhong District CPPCC and Deputy of Party Group; Mr. Yundi Li, Rolex Watch Ambassador and International Virtuosco Classical Pianist and Mr. Brahim Drissi, General Manager, Rolex Guangzhou Co. Ltd. as officiating guests. 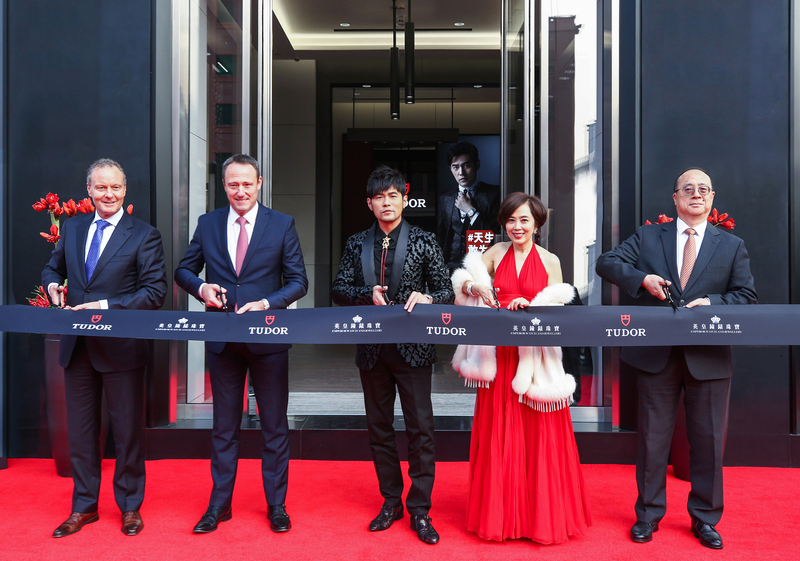 Emperor Watch and Jewellery’s Tudor Boutique at Beijing APM, had a grand opening on November 12, 2018 with (From the left) Mr. Daniel Neidhart, Managing Director of Rolex (Hong Kong) Limited; Mr. Eric Pirson, Director of MONTRES TUDOR S.A,; Mr. Jay Chou, Tudor’s global brand ambassador; Ms Cindy Yeung, Chairperson and Chief Executive Officer of Emperor Watch and Jewellery; Mr. Cai Zhiqiang, Chief Representative and General Manager of Beijing Office of Sun Hung Kai Properties (Beijing) Co. Ltd. as officiating guests. 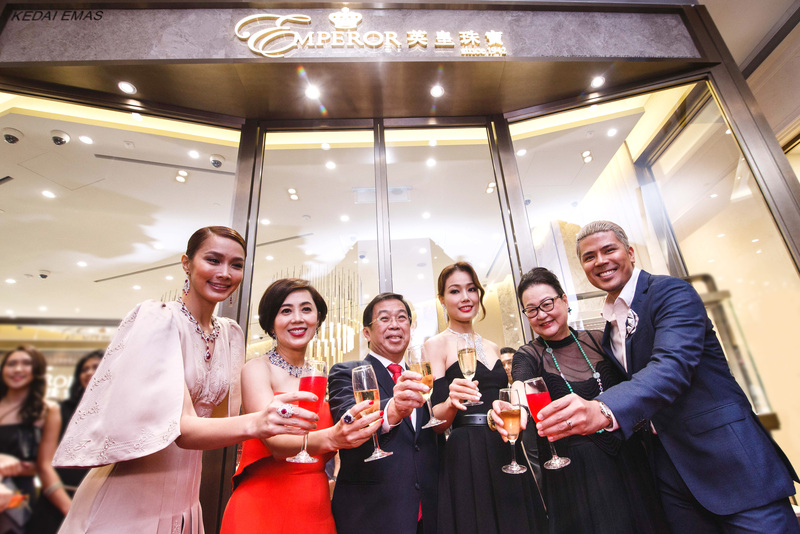 Emperor Jewellery’s first ever flagship store in Pavilion Kuala Lumpur, had a grand opening on November 27, 2018 with (From the left) Ms. Scha Alyahya, Malaysian celebrity; Ms Cindy Yeung, Chairperson and Chief Executive Officer of Emperor Watch and Jewellery; Mr. Tan Kok Wai, Malaysia Special Envoy to the People’s Republic of China; Ms. Joey Yung, Hong Kong Pop Star; Dato Joyce Yap, Chief Executive Officer of Retail of Pavilion Kuala Lumpur and Mr. Awal Ashaari, Malaysian celebrity as officiating guests.